What a beautiful weekend on Long Island. So much to celebrate and explore. It is my Birthday Weekend! My Hubby and 2 kids had plenty of surprises and gifts instore for me! I was dreading this milestone…seriously! Who wants to acknowledge HALF a century as my very good friend reminded it was! I will admit, I was alil melancholy about the number changing. I prewarned the family….NO PARTIES! Well, guess what! I made it! Honestly, it wasn’t even as painful as I had predicted! I must say my beautiful family put alot of thought and care into making my day really special. I had alot of quiet “im so lucky” moments, privately filled with love and gratitude for all I have in my life. My husband and I set off early to visit a few organic farmers markets and shop for little treasures. We drove down to Northport Harbor, sentimental and magical, it’s where our Love “bloomed”, and we spent many days and evenings together over the 30 years. We took a long scenic drive along the shore and had a scrumptious lunch outdoors at a new restaurant in the town we both grew up in. I had a couple of very “summery” cocktails, enjoying the mellow buzz of my yummy coconut rum drinks, the entire day was Heaven. After 34 years, I don’t say this enough at all honey…Thank you, Michael, for trying your best, taking care of all of us, and never leaving my side. For putting up with me for 30 Birthdays +, truly I know I am blessed and loved. I have been travelling for the last few weeks. Our annual trek up to New Hampshire to the Lake Houses has become a tradition for my husband’s family for the last 10 years. They host a 4th of July reunion yearly and relatives and friends gather for a long weekend. The lake is always beautiful, serene, and warm. The family boats and the kids kayak and paddle boat around and swim. The bonfire at night is warm and glowing and they all reminesce about days gone by….The Fireworks display over Canobi Amusement Park is spectacular! It’s a good time to reconnect and reflect on all the blessings we have today. I snuck back there last weekend for a “girls” weekend, we had so much silly fun and laughs. The lake was sparkling fresh and we even did alil Spa pampering treatment. It’s truly healing to reconnect with the ones you love & trust. It’s good food for the soul. As the world knows, this weekend was filled with sadness in Aurora, Colorado. We all watch in horror, terrified, bewildered as another massacre unfolds. None of us understand or can resolve how a human snaps and becomes a monster. We all pray for the victims and their families and thank God for giving us another day. Preheat oven to 350; smoosh 1.5 squares of break-apart refrigerated cookie dough into the bottom of each well. 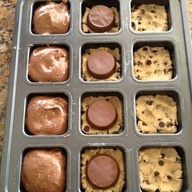 Place Reese cup upside down on top of cookie dough (or an Oreo!). Top with prepared box brownie mix, filling 3/4 full. Bake for 18 minutes! HEAVEN! I make a large pot of homemade tomato sauce and simmer these fried meatballs in the pot of sauce for 40 mins or longer. In a large bowl combine meats and add 2 eggs beaten. Add salt & pepper, garlic, grated onion and parsley. Mix in 1 cup breadcrumbs till mixture is well combined. Form into round balls about 3-4″ around each. In a non stick skillet on Medium/High heat add olive oil. Place 10 meatballs in skillet and brown on all sides. This should take about 20 mins. Transfer meatballs onto tray lined with paper towels and drain. Add the meatballs to simmering sauce and simmer low for 40 mins. I’m determined to figure this out!